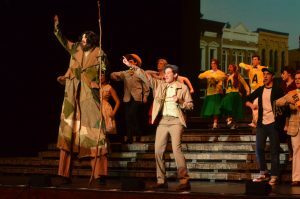 Big Fish School Edition is a slightly reworked version of the original Broadway script. 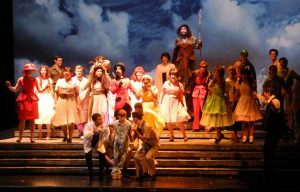 The School Edition has been carefully edited, with additional director’s notes throughout, to make the show more producible for high school groups. In some cases problematic language has been changed, while in others an alternate choice is offered at the discretion of the director. The curtain rises on present-day Edward Bloom (50s) at the banks of a river, skipping rocks. His son Will (20s) is getting married the next day. Will asks Edward not to tell any of his crazy stories at the wedding. Edward reluctantly agrees. As Will thinks back, he trades places with Young Will (8). Edward doesn’t want to read his son a bedtime story from a book, but rather tell a story about life (“Be the Hero”), which introduces many characters from Edward’s impossible stories. Edward’s wife Sandra reminds them that it’s time for bed, but Young Will wants to know more about the Witch who showed Edward how he would die (“The Witch”). The story returns to present day. Preparing for the wedding, Edward reveals his suspicion that Will’s fiancée, Josephine, is pregnant. Will confirms the hunch and swears Edward to secrecy. But Edward can’t help himself, revealing the news in a toast to the crowd. In parallel scenes at doctors’ offices, Will and Josephine learn they’re going to have a son, while Edward and Sandra learn that Edward’s cancer has progressed. In New York’s Central Park, Will sings of the wonder and mystery of his future child (“Stranger”), but his joy is interrupted by a phone call from his mother, telling him about Edward’s condition. Will says he’s coming home. In the backyard, Sandra tells Will that although he and Edward can be a handful, she loves them both (“Magic in the Man”). Josephine is eager to hear more of Edward’s stories, so he launches into a tale of his high school days (“Ashton’s Favorite Son”), including his small-town girlfriend Jenny Hill and his arch-rival Don Price. Edward journeys to a cave to confront a giant that is frightening the town. But rather than fight Karl the Giant, he befriends him and convinces him to join him on an adventure to see the world. (“Out There on the Road”). Back in the present, Josephine gets Will to tell her the story of how his parents met, which brings them to the Calloway Circus. Sandra and two friends audition for ringmaster Amos Calloway (“Little Lamb from Alabama”), during which Edward falls in love with her at first sight (“Time Stops”). Amos hires Karl The Giant, while Edward agrees to work for the circus for free in exchange for one monthly clue about Sandra (“Closer to Her”). After three years of toil, Amos (secretly a werewolf) finally reveals that her name is Sandra, she goes to Auburn University, and she loves daffodils. In the present, Josephine discovers a mortgage signed by Edward and Jenny Hill. Will wonders why his father would buy a house with a woman other than his mother. Back in Edward’s story, Edward travels to Auburn, only to discover that Sandra is engaged to be married to Don Price from Ashton. Don beats up Edward, but that convinces Sandra to break up with Don. 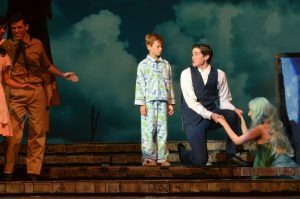 Edward promises to love Sandra forever (“Daffodils”). They kiss. Reeling from the discovery of the mortgage, Will wonders if his dad had a second life. A second family. Later, Edward tells Sandra and Young Will he’ll be traveling more for work. Edward tells Young Will he’ll be the man of the house. He needs to be brave and “Fight the Dragons.” In the present, Will attempts to ask his father about the mortgage, but Edward keeps derailing the conversation with jokes and talk of wooly mammoths. When Will brings up Ashton, Edward grows angry and they confront each other (“The River Between Us”). Calmed down by Sandra, Edward falls into an uneasy sleep and wakes up yelling and confused in the middle of a thunderstorm. Sandra comforts him, telling him “I Don’t Need a Roof” to feel at home. She only needs Edward. Will travels to Ashton, where he meets Jenny Hill. She tells him the story of what happened when Edward returned to Ashton. The valley is about to be flooded by a new reservoir, yet the townsfolk refuse to leave, chaining themselves to a statue in protest. Edward convinces them to build a new Ashton (“Start Over”). He gets land from Amos and money from Karl, both of whom have become successful because of Edward. Only Jenny Hill refuses to leave. She’d been waiting in Ashton all these years for Edward to return. To save her life, Edward reconnects with her, and co-signs the mortgage on a new house. They kiss — but Edward breaks it off. From the moment he saw her until the moment he dies, Sandra is the only woman he’ll love. As Jenny Hill finishes the story, Will gets a phone call. Edward’s condition has worsened. BIG FISH Props for rent from Prop Rentals NY Prop Rentals NY 516-459-0106 2180 Pond Road Ronkonkoma, NY 11779 Contact Chris Stockton at stocktc@sts.ab.ca for BIG FISH costumes and set pieces in CANADA.